From the lanai of Napili Point Vacation Rental Unit A9 you will have a 180-degree unobstructed view, extending from the island of Lana'i across Pailolo Channel to the island of Moloka'i. The sun sets on Lana'i in the winter and then on Molaka'i in the summer. When the sun sets into the ocean you will occasionally see the elusive green flash. With the sun at your back, rainbows of incredible intensity are formed on early morning showers. At night the stars appear to shower down upon the earth in the clear Hawaiian sky. On a morning when it's full, the moon will set into the ocean with a brilliance that must be seen to be believed. During the winter you will observe humpback whales swimming and breaching a short distance offshore. Spinner dolphins put on quite a show with their acrobatic breaching and spinning in Honokeana Bay and surrounding waters. 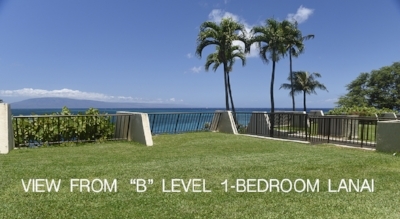 All of this without ever having to leave the comfort of Napili Point Vacation Rental Unit A9.